Grape hyacinths are a spring ephemeral which means they go dormant soon after blooming. 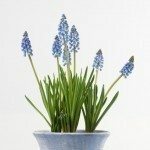 It is true that the flower business often packs bulbs in closer than one would plant in the garden but this isn't a problem for grape hyacinths. Plants must be in pots with drainage holes or you risk rotting the bulbs/roots. Water when the top inch of soil is dry - poke your finger in the soil. Overwatering and under watering create similar wilting in leaves. If they finished blooming a couple of weeks ago, they are probably going dormant. Otherwise consider using a bigger pot with standard potting mix. Here is a helpful article. Note that if you plant to keep these indoors, you'll have to create a cold treatment to trigger another bloom.